"Corporate Governance and Responsibility of Companies towards Community"
Mr Muthuraman joined the Company in 1966 and has held various positions at the Company including Vice President (Marketing & Sales) & Vice President (Cold Rolling Mill Projects). He was appointed as Executive Director in 2000, Managing Director of the Company in 2001 and non-Executive Vice chairman in 2009. He is the Chairman of Tata International Limited on the Boards of several companies which include, Bosch Limited, Tata Industries and Strategic Energy Technology Systems Pvt. 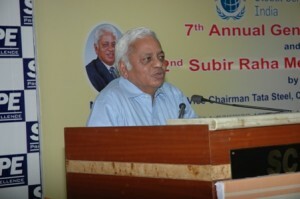 Ltd. Mr. Muthuraman is currently the President of Confederation of Indian Industry. He is also the Chairman of the Board of Governors National Institute of Technology (NIT), Jamshedpur. Mr. Muthuraman is also a member of the Business Advisory Council of Economic and Social Commission for Asia and the Pacific (ESCAP).